We are the most reliable and affordable event lighting delivery rental service in Southern California. If you are having a wedding, a birthday party or a corporate event, we can help you choose the right type of lighting that will add elegance, sophistication, energy and excitement to your celebration. The equipment will be delivered and set up at your event location by our professional lighting technician. In addition to affordable event lighting, we also offer sound equipment rentals, affordable DJ services, affordable photography and affordable videography. Unlike many of our competitors, we offer an easy online booking/planning system and phone calls are not required to complete the booking. We always respond to all inquires within 24 hours. Our services are very transparent and every client pays the same price. Our minimum order amount per event is only $350 and we deliver to Los Angeles, Riverside, San Bernardino, Temecula, Orange County and San Diego. For availability information and booking details, please use the following form. Please enter the name of the venue/location where your event will be taking place. Our 250-watt bright white outdoor-rated halogen lights are an excellent choice for weddings and festivals where the event area at your venue does not have enough lighting for people to see one another and have a safe time. These fixtures are not going to add class, elegance or sophistication to your event, but they are fairly bright and they will generate plenty of light so your guests can actually see their food and enjoy the function. We recommend at least 4 stands with 4 lights for events with 50-100 people in attendance. If you're expecting more than 100 guests, we recommend adding one extra light for each additional 25 guests. Outdoor flood lighting is the easiest and most affordable way to light up your event space for basic needs. Dance floor lights (also known as DJ lights) not only add energy and excitement to your dancing area, but also make a direct impact on how many people end up on the dance floor and how much fun they have. Our intelligent event dance floor lighting rental package includes four color wash lights (Chauvet Slim Par 38 or similar), one DJ laser effect and one American DJ Jellyfish or American DJ Mystic LED light - all mounted on a heavy-duty tripod stand with a T-bar. For the best possible effect, we recommend using two of these stands with six lights mounted on each stand and have us set them up on two opposite sides of the dance floor. This would allow us to professionally light up your dance floor from multiple angles. If you would like to have your name and wedding date projected on the wall or the dance floor, you would need a custom gobo monogram. Our LED gobo projector is bright enough for any light colored-surface and the colors and materials of the interior at your event venue will help us determine where exactly it's best to project your gobo. All custom gobos we offer are laser cut and made from steel. As soon as we get your inquiry, we will email you a brochure with some of the most popular design options we offer. Please note that we would need at least two weeks to process your order so it's best to choose your gobo about one month before the date of your event. ﻿LED up lighting is one of the most popular and affordable ways to enhance the look of your event venue and set the mood for the entire reception. In fact, LED up lights are one of the keys to a successful and unforgettable event. As you can see on the pictures, this type of lighting will match your theme color and bring your wedding or event to a much higher level. They can be set to any color, slowly fade through colors or even change colors along with music. All these​ ​ effects that can be easily changed with a click of a button. This type of lighting is popular both indoors and outdoors, but the fixtures are not waterproof so it's important to keep the weather in mind. There is no better way to highlight and enhance the look of your cake, desert table, gift table or even sweetheart table than centerpiece wash lighting. It makes everything look more elegant and beautiful. It's also very affordable as it starts at only $75 per table. One light mounted on a tripod stand is usually enough for small tables while bigger tables may required two or more lights. Each fixture can be set to any color to match your theme or even slowly fade through different colors. We highly recommend this type of lighting for weddings, birthday parties and corporate cerebrations. It's a cheap and easy way to impress your guests. Room wash lighting is another important tool that can greatly enhance the look of a reception hall or an outdoor patio area.​ ​Some of the most beautiful wedding lighting pictures available online look so great because, in addition to LED up lights, color wash lighting was used.​ ​Just like standard LED up lights, these fixtures consume very little power, never get hot and are much safer than regular 120-500 watt par can lights. ​​However, unlike ambient LED up lighting, color wash lighting is much more functional, because the lights are mounted on tripod stands, which allows the light to come from the top and cover a larger surface area. ​ Each light can be set to your desired color, slowly fade through colors or change colors along with music. ﻿Your room, reception hall, patio area, lawn or gazebo can be nicely decorated with our mini string lights, which is an excellent tool that adds charm and class to your event. We charge only $100 per each tripod stand that comes with 100 warm white mini globe lights wrapped around it. Depending on the size of your event and the number of guests you're expecting, you would need 6 to 20+ stands to create a beautiful effect and impress your event attendees. This type of lighting is much easier to set up and much more affordable than traditional wedding market lights. However, wrapping the lights around the stands still takes a while, which affects the cost of this service. One more thing to keep in mind is that these lights are not as bright as traditional market lighting so their main purpose is ambiance. The total balance listed on the contract is divided into three payments. The 1st payment ($200, non-refundable) is required to secure our services for your event date and it is due upon receipt. The 2nd payment (half of the remaining amount) is due 30 days prior to your event date. The 3rd payment (remaining balance) is due in cash upon arrival of our service crew member on the day of your occasion. Please note that our refund policy allows you to get your money back at any time before the due date and time of each payment, which is why we encourage you not to wait until the last moment and pay early. Unless you are worried about us not showing up, we recommend paying in full at least 30 days in advance, which makes it much easier for all parties involved and gives you the opportunity to pay via check, credit card, debit card or bank transfer. If the total order amount listed on the contract is less than $400, we require that you pay in full upon booking. If you decide to cancel the service after paying in full, the above refund policy will still apply and you will be able to get a portion of your money back before the due date and time of each payment (please see the contract for more details). Please note that the services will not be provided if any of the payments are not received on time. If we are unable to fulfill the contract due to causes which cannot be anticipated (earthquake, accident, etc. ), a full refund will be processed immediately. Otherwise, all payments are non-refundable after their due date and time listed on the contract. 1) Check payment (must be received at least 10 days before your event date). Write a check to “Golden Gate Sunrise Entertainment" and mail it to 5765 Lauretta Street, San Diego, CA 92110. This payment method is free for you and free for us. 2) Online bank transfer. Use your bank's free online payment transfer service (Chase Quick Pay, Wells Fargo Sure Pay, etc.) and send the money to this email address: GoldenGateSunriseEntertainment@gmail.com. This payment method is free for you and free for us. 3) Online credit/debit card payment. Per your request, we will email you an invoice and all you would need to do is enter your credit/debit card information. Because we have to pay a fee for each credit/debit card transaction, a 5% processing fee will be added to the total amount, which would cover our expenses to process this form of payment. The Client agrees to make payments in accordance with this agreement. Golden Gate Sunrise Entertainment (GGSE) will honor the price above and reserve the event’s date as long as the Client pays GGSE an initial, non-refundable payment of $100. The 2nd payment (half of the remaining amount) is due 30 days prior to the event date. The 3rd payment (remaining balance) is due in cash upon arrival of GGSE service crew member on the day of the event. The services will not be provided if any of the payments are not received on time. If the Client decides to cancel the booking for any reason, 2nd and 3rd payments can be refunded before their due date/time listed above. If cancelation request is made after payment due date/time, that payment will not be refunded. If GGSE is unable to fulfill this contract due to causes which cannot be anticipated, a full refund will be processed. GGSE’s liability to the Client under this agreement will be limited to the amount of the payments GGSE receives from the Client and GGSE will not be liable for any incidental, special, consequential, punitive or exemplary damages. The Client agrees to assume all responsibility for the loss and/or physical damage to all equipment provided by GGSE caused by the Client or Client’s guests at the event. The Client also agrees to assume all responsibility for obtaining and paying any permits, licenses, parking or other fees necessary for GGSE to complete the services requested. GGSE reserves the right to use pictures or videos taken at the event for marketing purposes. The Client agrees to fill out all additional planning forms and pay for any extra equipment and/or services provided by GGSE upon request of the Client. GGSE advises that a GGSE crew member remain at the venue throughout the event. If Client chooses not to pay GGSE’s usual fee for such service, the Client shall indemnify and defend GGSE from any loss or liability, including attorney’s fees or court costs in defense thereof, relating to GGSE’s equipment or Client’s use thereof, including injuries to the Client or Client’s guests, or damage to their property. 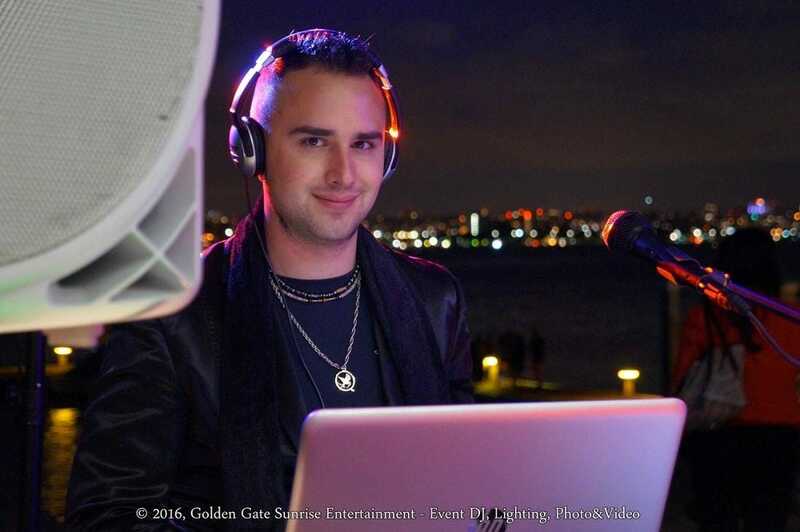 "Hi, I am Charlie, the owner of Golden Gate Sunrise Entertainment. I started this business in 2010 when I moved to California from Kyiv, Ukraine, which is in Eastern Europe. I worked hard building it from scratch and now we do between 200 and 300 weddings and events every year. I have a strong team of reliable, professional and very talented videographers, photographers, DJs, musicians, sound and lighting technicians. Although my main responsibilities are training, quality control, communication, planning and marketing, I still enjoy doing a lot of events myself. Regardless of what your budget is and which package you select, I’d like to assure you that I will be planning your event personally and it is my responsibility to make sure we deliver on what we promise and do it all it takes to keep you and your guests are happy. I’d like to thank you for taking the time to read this and encourage you to email me now so we can secure the services you need for your event date. I look forward to working with you and being a part of your special day." Can I pick up the equipment at your storage facility and set it up by myself to save money? Yes! This option is available for many of the services we offer and picking up the equipment at our storage facility is definitely less expensive than having us deliver it to your event location. Please email us to let us know what you need and for how long, and we’ll let you know the cost. Is your equipment easy to use? Yes, most of our sound and lighting equipment is very easy to operate and we will provide detailed instructions on how to use it. Do you offer market lighting? Unfortunately, at this time we do not offer traditional market lighting. This mainly has to do with its high cost and difficulty setting up. Please keep in mind that we offer other great affordable alternatives such as outdoor flood lighting or mini string lights. If I have my own DJ, will he be able to use your equipment for DJing? We recommend showing our package descriptions and photos of our equipment to your event or wedding DJ so that he can have a look at it to determine whether or not it would work for him.